A stunning 24lb 12oz PB common. Grahams pike caught using maggots and worms. We were as excited as 2 schoolboys at 11am on Sunday when we set off for Linear Fisheries in Oxfordshire for a 48 hour session. We had both done plenty of research and while Gaz had a fancy for Oxlease, my first choice was St Johns because of its superb carp average size and tench population. Gaz had spoken to the bailiff in the week who suggested St Johns, so that was plan A. When we arrived at 2.30 we decided to check out St Johns first. It was a lovely looking pit but it was busy, and no one seemed to have caught much all weekend. However, we fancied our chances of a bite or two as there were plenty of fish showing and as hoped for a couple of anglers vacated a double swim on the road bank and we decided to drop in these noted swims. We spun a coin for which side of the swim as the left risked getting cut of by someone fishing the other corner and the right was a bit more cramped overhead. I got the left which proved easier to fish with a gravel bar extending left to right going further out by 45 degrees, about 40 yards out for me. I started with a method as I figured they wouldn't get used that much on here, a single pop up and a PVA bag about 15 yards out. Gaz fished 2 variations of these methods. Back out went the method and I crawled into my sleeping bag to sulk. I fell asleep dreaming of 30s and about 7.45 I was awoken by the same rod screaming off. I scampered out the bivvy and was relieved to feel another very heavy fish on. Another powerful fight ensued. Initially we thought it definitely isn't as big as the first one, but as a terrific fight continued we knew that this was still a special fish in its own right. Having lost the first one I was absolutely a bundle of nerves. Gaz saw it and thought big mirror but when we got it a couple of rods out we could see a huge common. 5 more incredibly hairy minutes later Gaz netted it expertly and I punched the air from joy and also sheer relief. A dream common lay on the mat and the unhooking, weighing and photography was pure pleasure. We both guessed 24 and we were nearly right. We then were fast approaching our last night as the evening produced nothing but the odd bleep. I'd decided to go for 2 methods as that had been the rig that had worked. Just as it had got dark, about 10.30pm I had a knock on the new method rod, on half a cell boilie with fake pop up corn. A few seconds later it was off and YES I was in again. It came towards me at first and seemed like quite a small fish before fighting hard closer in. We thought mid double carp. 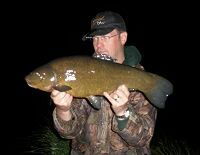 I joked it could be a tench but it's a big one. I hoped it was and, sweet Jesus, I was sure it was a green looking carp coming to the net. After a great scrap a superb tench lay in the folds of my net, glistening in the torchlight. It's a PB I thought, but I was amazed when, after carefully weighing the sling, it pulled the Fox Digis through right to 9lb..alternating between that and 8lb 15oz. I was very happy to settle for that, another stunningly proportioned and fit and healthy specimen as I hope you will agree. 8lb 15oz, the tench of my dreams. That was it - Gaz and I were so tired that we slept through the early morning with no further action. 4 runs between us in 48 hours, it wasn't easy going, but after catching my 2 target fish, it was a session and a venue I’ll never forget. We'll be back, but maybe for 72 hours next time!